Scientific context Sphingosine can be phosphorylated in vivo via two kinases which leads to the formation of a potent signaling lipid. It is a selective inhibitor of protein kinase C, but does not inhibit protein kinase A or myosin light chain kinase. 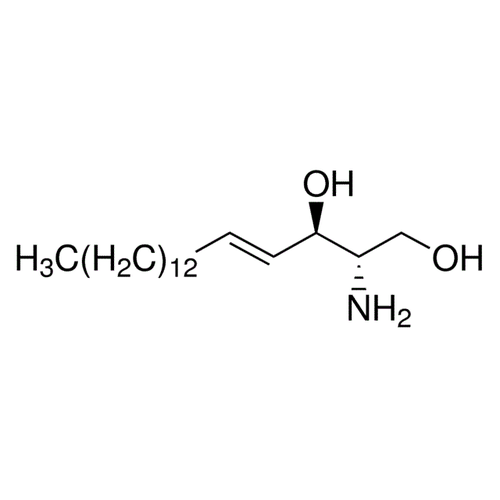 It also inhibits calmodulin-dependent enzymes and is the precursor of ceramide. Bibliography 1. Radin N. (2003) Biochem J. 371(Pt2): 243-256. 2. Carter H.E., Glick F.J., Norris W.P., Phillips G.E. (1947) J Biol Chem. 170: 285-295. Representative figure legend Chemical structure of Sphingosine (SIH-202), a Protein Kinase C inhibitor. CAS #: 123-78-4. Molecular Formula: C18H37NO2. Molecular Weight: 299.49 g/mol. Chemical structure of Sphingosine, a Protein Kinase C inhibitor (SIH-202). CAS # 123-78-4. Molecular Formula: C18H37NO2.